The Isle of Wight is a popular destination for many - and growing as a vacation destination. It is less than three miles from the South Coast of Britain and directly on the English Channel! The reason it is such a popular vacation destination being on the south coast of England makes the Isle of Wight even more popular as it is easy to get to - and there are many transit services that take visitors to the Isle. Although there are only over a hundred thousand inhabitants on the island there are over a million visitors each year! This is an astounding amount of visitors on these small islands. The Isle runs on tourism and all workers in the industry strive to get things right and keep visitors coming back year, after year. There are less than five hundred miles of roadway on the Isle of Wight. Efficient trains and small roadways link the small towns and communities together. Not only are the beaches spectacular but the festivals that occur through the year are a wonderful way to experience the Isle of Wight culture. The food and drink festival at the end of the summer is a great way to immerse yourself in the Isle of Wight Culture. It is world renowned as the month of taste! Interestingly enough, there are more than thirteen award winning beaches on the island. That is many to choose from. It's a good thing that there are large assortments of beaches to house the millions of tourists that visit each and every year. The beaches are great destinations because they are inspected daily for safety and upkeep - not like many other beach destinations that are available to visit. From Colwell to Seagrove - each beach is bound to be just as perfect as the rest. From the beautiful seas to the seaside resorts, the Isle of Wight is perfect for your next holiday destination. About the Author - This article was written on behalf of Utopia Spa, Spa Breaks and Health Spa. Large three bedroom mobile home in the picturesque setting of Whitecliff Bay, 100 meters from a private sheltered, sandy beach in the peaceful holiday park of Sandhills. Sandhills Holiday Park is situated in a rural cliff-top position of the eastern coast of this glorious island with views over the English Channel where there are passing liners, yachts and fishing boats. It is on the coastal footpath making it an ideal base for walkers and overlooks the sandy beach of Whitecliff Bay perfect for family holidays. The nearby large village of Bembridge has good facilities including a harbour, shops and museum. The Park is easy to reach from the mainland but feels like you could be on holiday abroad. Sleeps 8. St Austell is a four bedroom detached house between Shanklin and Sandown, and within close walking distance of beautiful sandy beaches and clifftop walks. St Austell is situated on the outskirts of Lake between Sandown and Shanklin. This four bedroom detached house is situated within walking distance of beautiful sandy beaches and clifftop walks. 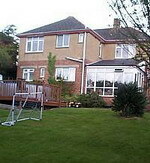 The house has a large garden and 12ft splash pool, and is popular with larger families. Sleeps 7. Large 3 bedroom mobile home with sea view and beautiful sandy beach. 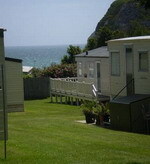 Ideal for family beach holidays or walking holidays and in a stunning location. Sandhills Holiday Park is situated in a rural cliff-top position of the eastern coast of this glorious island with views over the English Channel where there are passing liners, yachts and fishing boats. It is on the coastal footpath making it an ideal base for walkers and overlooks the sandy beach of Whitecliff Bay perfect for family holidays. The nearby large village of Bembridge has good facilities including a harbour, shops and museum. The Park is easy to reach from the mainland but feels like you could be on holiday abroad. Sleeps 8.